Strange mystical forces seem to be gathering around the village of Devil’s End where an ancient barrow is being investigated by Professor Horner (Robin Wentworth). The archaeological dig at the barrow is also being filmed be a television crew, who intend to show live coverage of the event on BBC Three as the Professor attempts to breach the inner chamber at the stroke of midnight. 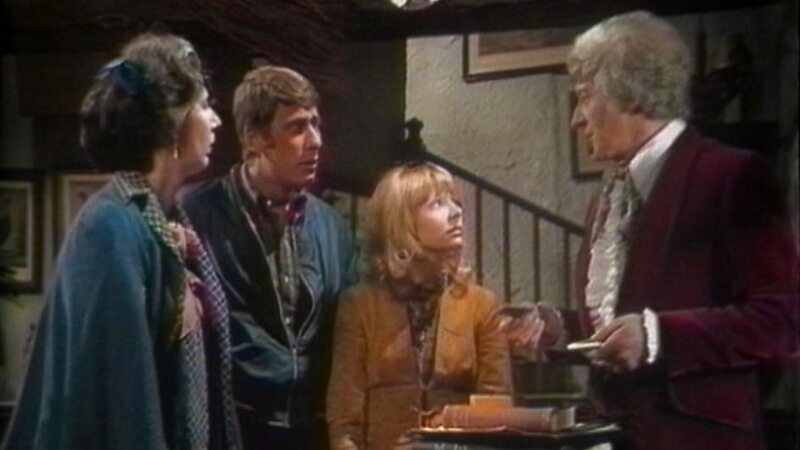 Alarmed by what forces the Professor might unleash, the Doctor (Jon Pertwee) and Jo Grant (Katy Manning) travel to Devil’s End to stop the dig but arrive too late, and the Professor and the Doctor are both enveloped in a freezing blast of energy from inside the barrow. With the Professor dead and the Doctor frozen in ice, Jo seeks help from the villages. Having seen everything happen on TV, Captain Mike Yates (Richard Franklin) and Sgt Benton (John Levene) take the Brigadier’s helicopter to Devil’s End to go and help Jo and the Doctor. After they arrive the Doctor quickly recovers, leaving them free to explore the village, and together with the help of the white witch Mrs Hawthorn (Damaris Hayman), they discover that the local vicar – Mr Magister – is really the Master (Roger Delgado) who has been using black magic rituals to summon the monstrous Azal to the cavern beneath the church. The Doctor explains that Azal is the last of a race of beings known as the Daemons, their super science is so powerful is appears to work like magic, and their spaceship is actually miniaturized inside the barrow itself. By tapping into the Daemons powers the Master has gradually twisted the village’s minds, forcing them to serve him, while Azal generates a heat barrier around the Devil’s End to keep the Brigadier (Nicholas Courtney) and the rest of UNIT from entering the village. Each time the Master summons Azal the Daemon’s energies continue to build, until he states that Earth is a failed experiment by his people, and that he will either bequeath his power to a worth successor or destroy the world. As the Brigadier and his team race against time to build a machine to break through the heat barrier, the Doctor has to rescue Jo from the Master before he sacrifices her to Azal so he can claim the Daemon’s power. The Daemons (1971) is the jewel in the crown of the Eighth Season of Doctor Who. Jon Pertwee and Katy Manning are now fully established in their roles, they make a fantastic team, and Jo continues to prove how resourceful she is by coping so well when the Doctor is frozen in ice. The 3rd Doctor may come across as slightly arrogant and rude at the start of this story by Guy Leopold (which was actually a pseudonym for Barry Letts and Robert Sloman), but his haste to get to the dig is soon balanced out by his resolve to help the villages escape the Masters influence. The Daemons is one of those Doctor Who stories where the story and special effects all come together to make a truly remarkable adventure, and offers a clever juxtaposition between science and magic. This is also one of the finest UNIT stories, and is full of classic moments. Katy Manning also has a pivotal role to play, as it is Jo’s willingness to sacrifice herself to stop Azal killing the Doctor that ultimately turns the Daemon’s own power against him – with explosive results! Christopher Barry directs this adventure with a real flair for the darker aspects of the story, particularly during the spooky opening sequence, and later staging some spectacular chase scenes between Bessie and the Helicopter, as well as the moment when UNIT finally breaks through the barrier to attack the church – which is being guarded by the living statue Bok. The gargoyle Bok (Stanley Mason) is one of The Daemons best examples of how magic and science are used to play on everyone’s deep rooted fears and superstitions in this story. While Azal remains unseen for much of The Daemons, it is Bok who acts as the emissary of the Master’s power, flying from scene to scene, dealing death and destruction to anything that stands in its way. 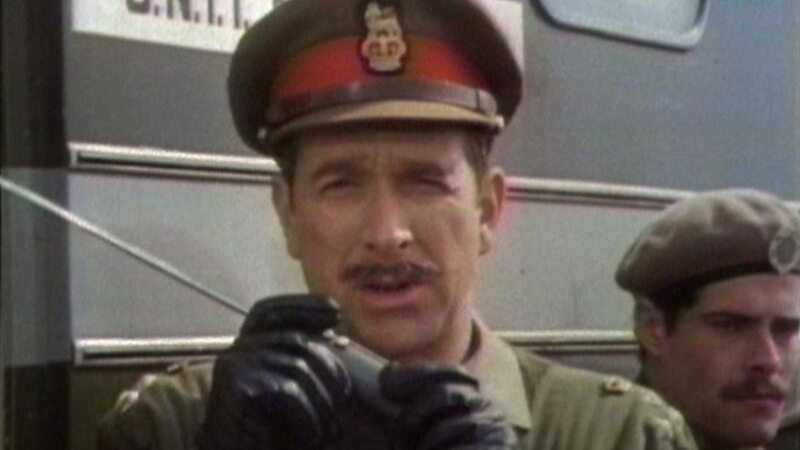 Bok is also responsible for one of the Brigadiers most memorable lines in Doctor Who, when he sees the creature for the first time and says: “Jenkins… chap with wings there. Five rounds rapid!” Even when Benton shoots the gargoyle with a bazooka, it explodes and suddenly reassembles itself. Azal’s presence in the story is often portrayed by waves of heat and ice as the creature shrinks and grows from its miniaturized spaceship, these have devastating effects, and one is even responsible for thawing out the Doctor after he was frozen. The poor Policeman who was left guarding the barrow is squashed flat by Azal as he stomps across the countryside, leaving a trail of giant cloven footprints that Yates and Benton spot from the air. The heat barrier is also a very clever part of the story, and well realized by simple visual effects, although one wonders why a creature as powerful as Azal would need such a thing when he can destroy the world so easily – he even implies that his people were responsible for destroying Atlantis as one point. 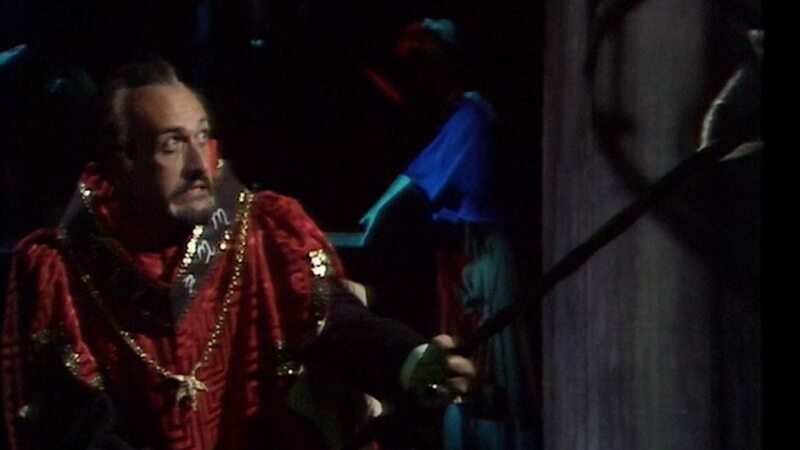 When he does finally appear Azal (Stephen Thorne) is perhaps the weakest aspect of the story, the CSO is not very good, and so it was probably a good move to hold off revealing the Daemon’s appearance until the final episode. Roger Delgado is absolutely wonderful as the Master in this story. 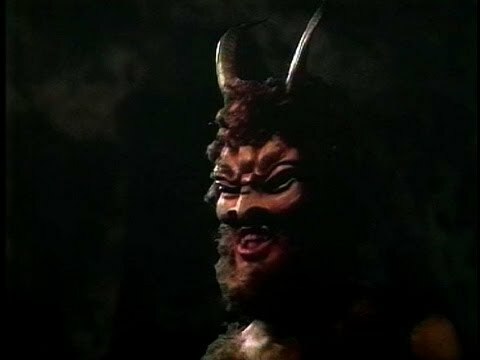 The renegade Time Lord makes a perfect enemy for the Doctor, although he may have been overused in Season Eight, appearing in every story, The Daemons is undoubtedly one of the best Master stories of all time. 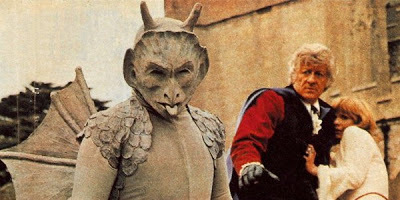 Few Dr Who Villains have ever warranted a cliff-hanger of their own, but when the Master foolishly summons Azal when he is alone in the cavern, even the Master is left covering in fear as the giant Daemon lumbers towards him. Of course the Master is eventually captured at the end of this story, in a charming scene that makes a perfect end to one of Doctor Who’s best seasons. Paul what a wonderful review! The Master is superb in this and those Daemons – just fantastic! Jon Pertwee is growing to be one of my favourite Dr now! Brilliant review of a one I will have to revisit! Thank you very much Beth, so glad you enjoyed the review. Jon Pertwee is such a good Doctor, its a great UNIT story as well, and the Master is brilliant! The Daemons were great monsters! An excellent story, well worth a revisit.